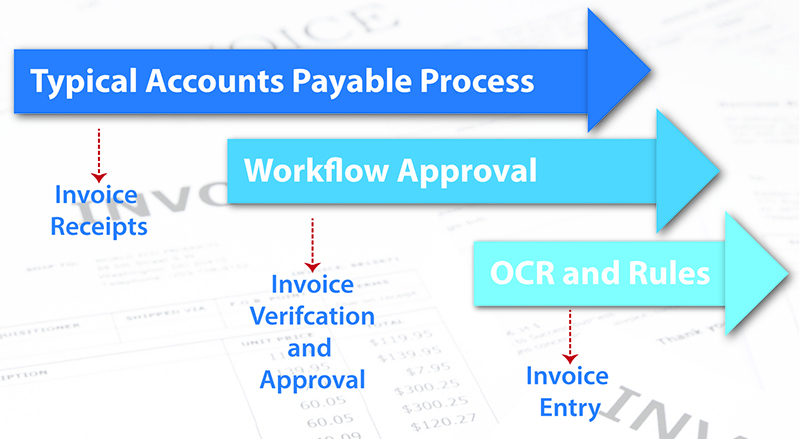 DO YOU WANT TO AUTOMATE ACCOUNTS PAYABLE INVOICING? Titan’s easyInvoice is an easy Choice! Jennifer, in Accounts Payable (AP), decided to retire after 33 years with the company. The retirement party was fabulous, the cake was delicious, and the sparklers burned late into the evening. The next day, the business had a hangover. For years, they had processed AP the same way, with Jennifer being the engine, and now she had retired. There were challenges — many invoices were late getting paid because the invoice was in the field awaiting approval and proper accounting to cost centers or orders. Finance was holding their breath because they were not sure how much to accrue for the period. Lost or delayed invoices were prevalent for field marketing and services invoices. AP is one focus area where many companies look to reduce costs and automation is the answer. Each step of the AP process flow can be targeted for automation and improvement. After a review of the P2P processes, the Controller decided to capitalize on the organizational change and further reduce costs, headaches, and improve the process. How do you automate with a goal of cost reduction and process improvement using hands-free capabilities, workflow, and mobile technology – and get results in weeks, not years? Vendor invoices that come through the mail, email, or fax all require someone to touch them. Once touched, they must get approved and posted to SAP. We advise our small and medium-sized clients to pilot a small, low-effort, high-results portion of the business. An example: One of our client’s biggest headache was transportation invoices. The problem was getting the hundreds of invoices matched to sales orders and approved. Improvements were needed to ensure timely payments to critical supply chain vendors. The majority of the invoices arrived by email. The AP department had resources dedicated to reviewing the AP inbox and routing the invoices to the transportation managers for approval. Look at Titan’s easyInvoice AP Automation solution! With easyInvoice, emails, faxes, or snail mail invoices are scanned and deposited into a shared folder. The sending email address triggers the AP Workflow as well as creates the SAP incoming invoice transaction and presents the vendor name and related information such as standard terms. The Delegation of Authority (DOA) structure contains the approvers and authorization levels. If an invoice requires multiple approvers due to either amount or spending type, i.e., capital expenditures (CapEx), the workflow can handle multiple levels of authorization. True AP Automation includes hands-free processing. For hands-free processing, invoices are scanned directly from the email, network fax, and proposed in the AP Incoming Invoice transactions. Once the invoice workflow is approved, the invoice transaction is either posted or put on hold status for further review by AP. The workflow streamlines the process to ensure that the invoices are visible, accurate and accounted for on a timely basis. Adding OCR capability provides scalability and reduced time on processing, reconciling and period-end activities. During the approval process, the invoice is routed according to the workflow rules and the DOA created for the vendor, invoice type and invoice amount. For example, if engineering needs to approve the invoice, the scanned invoice is emailed to the list of authorized approvers in that department. If the invoice amount exceeds an approver’s authorized spending limit, the invoice is forwarded to the next level of authority. Each approval is logged and captured for reporting and audit purposes. In our anywhere, anytime workplace, the invoice is routed to wherever you retrieve your email — laptop, smart phone or tablet. Any authorized approver can accept, reject or modify the process. The modification allows the approver to change the assignment of the invoice to a project, separate cost center or internal order. Automating Accounts Payable drives efficiencies, accuracy, cost reduction, and scalability to your critical supply chain processes. Titan’s innovative easyInvoice AP Automation solution enhances the visibility of these processes and adds value to your business, in weeks, not years. If you would like to see how Titan and easyInvoice can help you reduce your TCO of SAP, contact Warren Norris, warren@titanconsulting.net, 972.679.5183; or your Titan Consulting Sales Director.